I am looking for this stuffed duck, which was made by Carter’s in 2006-2007. This duck came as part of a gift set with a white blanket that had yellow ducks all over it. 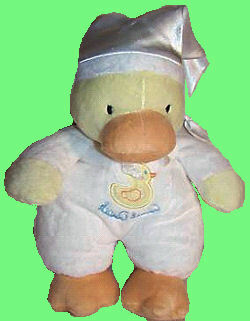 The duck looks like he is wearing white pajamas (with a yellow duck on his stomach and under the duck it says “quack, quack”). I am only looking for the duck. I received this duck as a baby shower gift, and, for whatever reason, my son took to it. “Duckie” goes with us everywhere and, when my son, who is 21 months, is crying or upset, he will cry for “Duckie”. “Duckie” is not only my son’s travel companion, but he is also his night time pal and safety object when we go places my son is hesitant about. Since “Duckie” is well loved, his hat is starting to fall apart (it has been sewed multiple times), and he is starting to show his wear from the constant handling, kisses and hugs he gets, and washings to keep him clean. I am afraid of what will happen when “Duckie” is no longer able to be taken everywhere, and would like a back-up to have on hand if/when the time comes. I have been searching for this duck for over a year now, thought I found one on a website that specializes in baby gifts, but, when I inquired, they contacted Carter’s who said the item was discontinued. I did a nationwide search on Craigslist, found one in Iowa, but, when I inquired to see if the person would mail it out of state, they never responded to my multiple emails. I also found one on eBay, but was outbid on it and have not seen one since. Any help in finding this elusive duck would be appreciated by me and my son!!! If you can help Lori find this Carter’s Yellow Duck with White Satin Stocking Cap and Quack, Quack Duck on White Sleeper, THIS SITE IS NO LONGER ACTIVELY MANAGED. Please use Our FREE FACEBOOK GROUP, including #101408-2 in the subject, . Thanks Tami! I emailed Lori to read the comment. Tami R. only 17 hours left. I sent her both, in case she misses the cheaper one. Thanks as always!!! If Lori wants it let me know. Thanks for the posts. I bid on the one on ebay. If I do not win it, I would be interested in the one Tami found. I will know more tomorrow. Hurray Lori won the Quack Quack duck by Carters!! Great price too. Great! I hope you didn’t get stuck with a purchase from the eBay seller, though. Let me know. No don’t worry. I have bought and sold a couple of these. She got an awesome price with the blanket included! Thanks for all your help! I won the auction on ebay and am anticipating the arrival soon. Good thing I upped my last bid before I left for work this morning, as it looked like whoever tried to outbid me came pretty close. FANTASTIC! I’ll mark this one FOUND!!! I am looking for one of these as well. I am worried that my daughter will loose hers. It is here favorite nite-nite friend. There is a new one with the blanket on eBay right now. Search for 380033516016. I hope you see this Jeff. I am also looking for this duckie. Ours is getting old and my 2 year old daughter is very attached to it. You need to Contact Us, so we can help you. Hello!! I am also looking for this duck! "Ducky" is a favorite of my little guy's and he's starting to show signs of age! Any help would be greatly appreciated! Thanks so much! !